to contact the eldest daughter of 1st Lieutenant (maybe promoted to Captain) Harry Lee Roy who died 30th January 1967 in an air accident near Redwood City in San Francisco Bay (NTSB Report here). The lady has a beautiful letter written at the time of his daughter Leigh Ellen's birth (9th July 1949) which she would like to pass on. Leigh Ellen's mother is Mildred and her sisters are Regina Ann and Tammy. 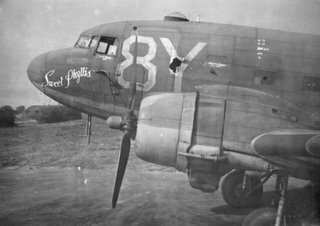 1st Lieutenant Roy, whose home town was Wellington, TX, was stationed in England during WWII (with 98th Squadron, 440th Troop Carrier G.P.A.P.O-133, US Army, Exeter Airport, Devon) and the two families struck up a long friendship until his untimely death in 1967 in an air accident at which point he was a psychiatrist in private practice in Houston, TX. Some of this information was found on the very useful website of The 440th Troop Carrier Group History Project. My father was in the 95th Squadron and I have a book called DZ Europe. I looked up Lt. Roy and found a picture of the flying officers of the 98th Squadron. My father died in 1991. I attended a reunion of the 440th WWII which included the 95th,96th,97th and 98th Squadron. Lt. Roy address during WWII is listed in the book as Route 2, Wellington, Texas. My dad, also a pilot, attended several reunions before his death. If you still need information on locating Lt. Roy's daughter, I know my mother gets a newsletter and has saved everyone since they started having reunions. She can most likely connect you with someone from the 98th Squadron that is still alive that can help you find out more. My dad kept in touch with many of the men in the 440th through Christmas Cards for years, these men were very close. Many of them are no longer living but there is a chance someone will help. Since we are from Texas my dad most likely knew him. The small town Texas boys stuck together. My grandfather was in the 95th Squadron, his name was 2ns Lt. Wilmer S. Weber-he was a navigator. Do you happen to have any information on him? He just passed away on March 31, 2007 at the age of 85. He did attend many of the reunions so I was just wandering if you may have been lucky enough to know him or meet him. He was a great man. I love you Pop! Was the photo of Sweet Phyllis taken at Exeter Airport? I run Exeter Memories and am working on a history of the irport and a photo essay. I would very much like to contact 'anonymous'who posted a message on your site regarding contacting the eldest daughter of 1st Lieutenant Harry Lee Roy as I may be able to help. came across this website by accident and may have some news about eldest daughter of Lt Roy.